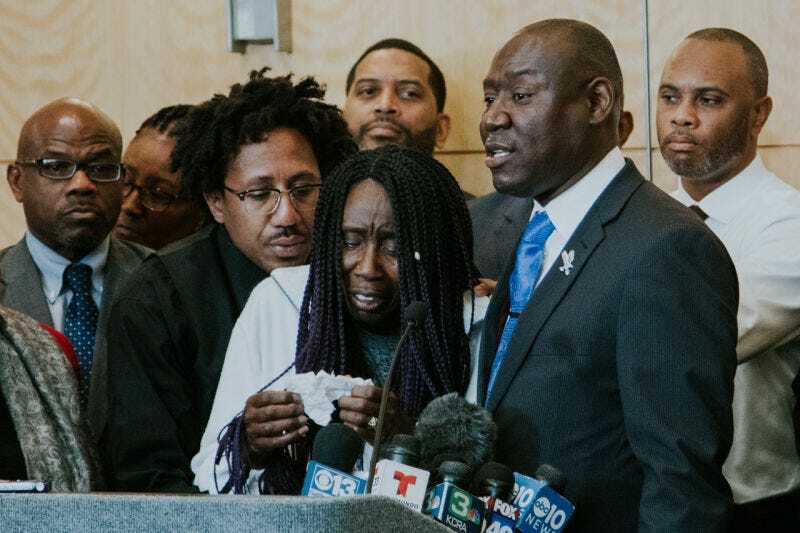 Stephon Clark’s grandmother Sequita Thompson delivers a tearful speech at a news conference in Sacramento, Calif.’s City Hall on March 26, 2018. Clark’s uncle Kurtis Gordon (left) and family attorney Benjamin Crump (right) stand with her at the podium. Sacramento police officers have a new foot chase policy as of late last month, and it is reportedly in response to the shooting death of Stephon Clark five months ago. Additionally, officers who begin a foot chase are required to activate their body cameras immediately and broadcast the reason for the chase as well as a description of the suspect. If you recall, the night police said they feared for their lives and shot Stephon Clark for holding a cell phone in his grandmother’s backyard, he was only being pursued for what would have amounted to a misdemeanor vandalism charge. He hadn’t taken anything. He hadn’t threatened anyone. He hadn’t harmed anyone. At the time that they shot him, Stephon Clark had no idea it was two Sacramento police officers who were chasing him. A sheriff’s helicopter circling in the air above him guided the police to his location, but not once were any commands given to him from the helicopter. Instead, police chased him into his grandmother’s backyard. They peeked around a corner, yelled “Show me your hands! Gun! Gun! Gun!” then unloaded 20 shots—ten shots each—seven (or eight, depending on which autopsy report you believe) of which struck and killed him. Stephon Clark died not knowing who shot him because the police did not identify themselves until five minutes after he was shot and killed. No commands from the helicopter. No identification from police. Oh, but the new policy covers that as well. Officers are now required to identify themselves as police and issue a command to stop. KCRA asked Sacramento Police Chief Daniel Hahn if this policy would have changed anything about the night Stephon Clark died. There were no announced penalties for not obeying the new policy, so it seems like something that will be easily ignored by offices who wish to sidestep it. Oh, so it’s just “direction,” “guidance,” and something “to think about” when they get into a pursuit situation. Identifying yourself as a police officer should be Police Officer 101-level knowledge. It’s hard to understand how that wasn’t already part of police policy. Again, these officers were chasing after someone accused of breaking windows—not a murder suspect. Understanding when it’s important to continue a chase and when you could safely let it go should also be Police Officer 101-level. This is a bandaid on a deadly bullet-wound.